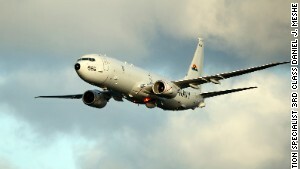 (CNN)The U.S. Navy on Tuesday sent a guided missile destroyer within 12 miles of a disputed island in the South China Sea where China has built an airstrip -- prompting China to scramble fighter jets and dispatch warships to "expel" the American ship. "USS William P. Lawrence exercised the right of innocent passage while transiting inside 12 nautical miles of Fiery Cross Reef, a high-tide feature that is occupied by China, but also claimed by the Philippines, Taiwan, and Vietnam," a Pentagon statement said. 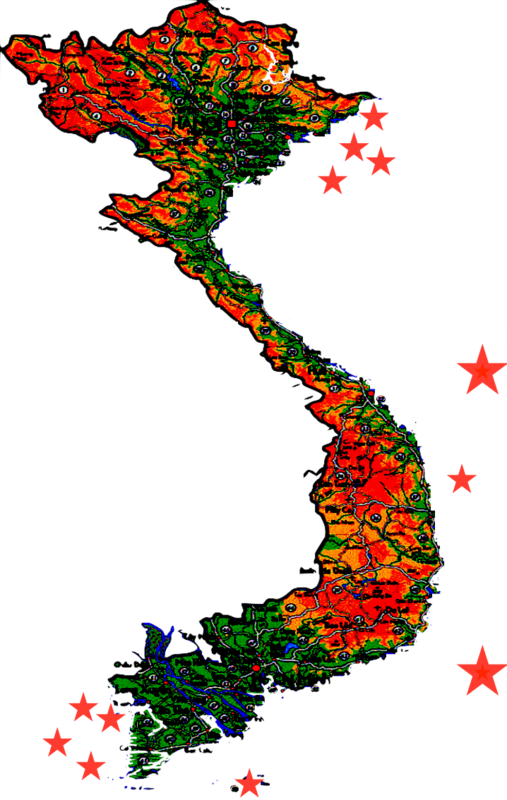 "This operation challenged attempts by China, Taiwan, and Vietnam to restrict navigation rights around the features they claim ... contrary to international law," the statement continued. Under the United Nations Convention on the Law of the Sea, 12 nautical miles is considered the limit at which a nation's rule extends off its shores. The Law of the Sea defines "innocent passage" as a transit in which a ship does not conduct any military, commercial or research activities. The Pentagon statement said the U.S. did not notify any of the countries involved about the destroyer's transit in advance. The guided missile destroyer USS William P. Lawrence transits the Philippine Sea earlier this year. Chinese vessels challenged the Lawrence a dozen times by radio, a U.S. official said, but the Chinese ships did not come as close to the U.S. ship as they had during previous times the U.S. sent ships through waters near disputed islands, including Fiery Cross Reef, which is in the Spratly Islands. "This operation demonstrates, as President Obama has stated, that the United States will fly, sail, and operate wherever international law allows. That is true in the South China Sea as in other places around the globe," the Pentagon statement said. The Chinese Defense Ministry reacted defiantly. "The unauthorized entry by the U.S. warship into waters near China's Nansha Islands (which China calls the Spratlys) was an act of serious provocation," Senior Col. Yang Yujun, spokesman for China's Defense Ministry, said in a statement. China dispatched two J-11 fighter jets, a Y-8 warning aircraft and three warships, a guided missile destroyer, a guided missile frigate and a frigate, to the area, Yang said. 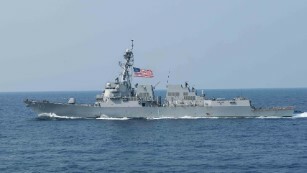 They "promptly identified the U.S. warship and issued warnings to expel it from the area," Yang said. A Chinese Foreign Ministry spokesman also criticized the U.S. Navy's move. "The relevant Chinese department took measures of monitoring, tracking and warning in accordance with the law. I have to point out, this action by the U.S. side threatened China's sovereignty and security interests, endangered the staff and facilities on the reef, and damaged regional peace and stability," spokesman Lu Kang said. The South China Sea is the subject of several rival -- and often messy -- territorial claims, with China, Brunei, Malaysia, the Philippines, Taiwan and Vietnam disputing the sovereignty of several island chains and nearby waters. Fiery Cross Reef is part of the disputed Spratly Islands. In January, China said it had completed building a runway on the island, one of three it has been constructing in the South China Sea with dredged material. Tuesday's passage of the Lawrence is the third that the U.S. Navy has conducted in the South China Sea. Last October, the guided missile destroyer USS Lassen passed within 12 miles of Subi Reef in the Spratly Islands. And in January, the guided missile destroyer USS Curtis Wilbur sailed within 12 miles of Triton Island in the disputed Paracel Islands archipelago. The U.S. official said Tuesday that the U.S. would continue with such transits. Yang, the Chinese Defense Ministry spokesman, said the U.S. moves justify China building military facilities on the disputed islands. "The provocative actions of U.S. military ships and airplanes have exposed the U.S. motive of trying to destabilize the region and seek benefit from it. It also proves again the rationale and necessity of China's construction of defense facilities on relevant islands and reefs," Yang's statement said. "Based on our needs, we will intensify our patrol in relevant waters and airspace, and improve our defense capabilities to firmly protect national sovereignty and security as well as to preserve peace and stability in the South China Sea," the statement concluded. While the U.S. asserts its rights on the sea, the Philippines is doing so in court, filing a lawsuit challenging the Chinese occupations. Analysts believe that the ruling from the international tribunal in The Hague, Netherlands, which is expected this month, will be unfavorable to the Chinese. The South China Sea moves have chilled U.S.-China relations. In late April, the U.S. Navy aircraft carrier John C. Stennis and its strike group were denied a port visit in Hong Kong. China criticized the U.S. reaction to the denial of the Stennis port call in Hong Kong as a "blowhard performance" for the media in an editorial in the state-run Global Times. "A few U.S. warships being denied entry to Hong Kong should be of no consequence to Beijing and Washington. Over the past few years, the Pentagon has played a series of tricks against China, creating quite an unpleasant atmosphere between the two sides," the editorial said. That came just a few weeks after Secretary of Defense Ash Carter visited the Stennis while it was operating in the South China Sea. "We want to reduce tensions, but we also want everybody in the region to be able to rise and develop in their own way," Carter said at the time. Also in April, U.S. Pacific Command began flying A-10 Thunderbolt jets and HH-60 Pave Hawk helicopters out of Clark Air Base in the Philippines with part of their mission "assuring all nations have access to air and sea domains throughout the region in accordance with international law," according to an Air Force press release. The Air Force said the aircraft would be flying in international airspace near Scarborough Shoal, which is claimed by both China and the Philippines and lies around 130 miles from the Philippines' capital of Manila.